There are so many options for weddings when it comes to what style of wedding you want to achieve. The more traditional sit down 3-course wedding is not the only food service option out there when it comes to weddings, other options include banquet service, buffet, bbq and canape/cocktail style. 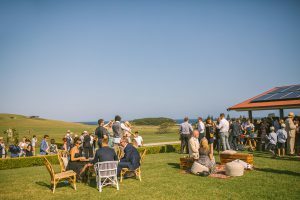 Let’s run through some things to consider if having a cocktail/canape or a sit-down wedding. Hire Equipment; Consider everything you need when you sit down for a meal that may need to be hired in, so depending on what your venue already has in terms of hire and equipment, you will need to consider entrée and main plates and cutlery, dessert cutlery or spoons, water and wine glass and napkins at each place setting. Have a think about what chairs and tables you will hire and if tablecloths are needed. For every set of approx. 8 guests, we recommend a water jug, wine carafe to place a bottle of white wine or champagne in and a bottle of red to be placed on the table per 8 or so guests. If you are having a buffet, consider the need for a few additional tables and clothes for this, along with placing the plates and cutlery at the buffet table instead. 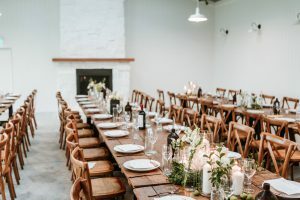 You may want to consider the cost of your hire equipment for a sit-down meal will be higher than a cocktail style where cutlery, additional plates and glassware and seating for each guest won’t be needed. Styling The Table; Centrepieces and tabletop stylings such as candles and votives, vases of flowers, table runners and other props. 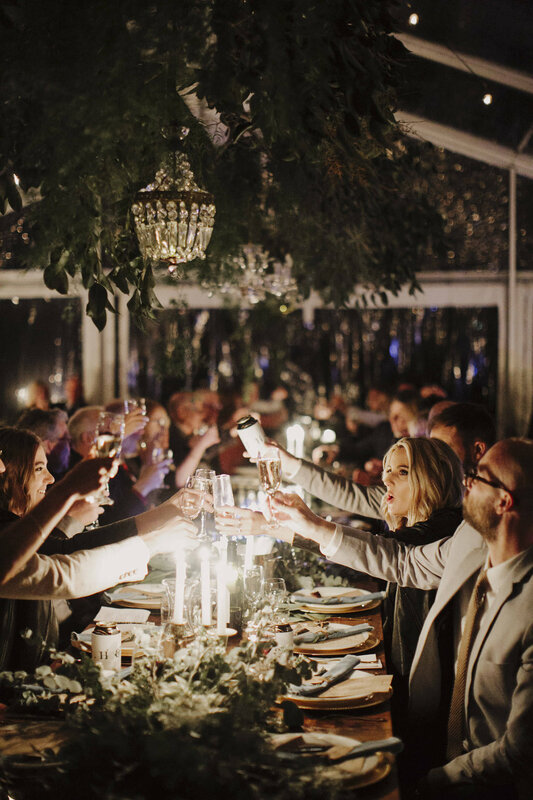 Keeping in mind if having a banquet service you need to leave gaps for the food so we recommend spreading out the styling into a few areas only and keeping the rest relatively spacious, or it all gets cleared anyway to make way for the food by catering closer to service time. Consider having a seating chart with place cards for each guest and/or menu cards plus some people choose to give their guests a favour or little guest gift at each setting. Setting Up; Setting up the sit-down dinner takes quite a bit of time, for most average 100 guest weddings our team of 2 or 3 may take anywhere from 2-4 hours to set up and style the dinner tables, depending on how detailed the set up is of course, if DIY this option just allow for plenty of time to do this, or if your venue allows set up the day before the majority. 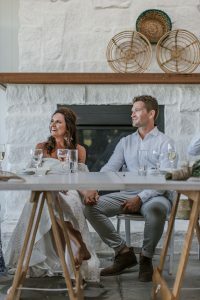 Cocktail style weddings are certainly less structured than a more formal sit-down wedding but to ensure guests are comfortable for the duration of the wedding means you need to consider both your furniture choices and food choices to make sure everyone is happy. The main two reasons our couples choose to do a cocktail or stand up dinner is they think this is more cost-effective, which is more often than not a myth, cocktail food often takes more time to prepare and can possibly be more fiddley with lots of different elements and a wider range of choices and ingredients needing to be sourced, rather than a 2 option sit down meal (think chicken or fish). Cocktail style weddings can still have the traditional formal elements like speeches and first dance but instead of finding your seat and sitting down to a meal you are mingling and enjoying your food sporadically. Furniture Hire; For cocktail weddings, sometimes we find the furniture hire is actually more expensive than sit down. I highly recommend seating for approx. 75% of guests for a cocktail style. So, for 100 guests seating for about 75 guests is a good ballpark. Sometimes guests find a seat early on, plonk down and don’t tend to move so it’s important there is enough seating to go around. Providing a few seating options is important for picnic seating on the ground featuring throws, cushions and rugs, bar tables and stools and couches, bench seats or similar. It’s nice to provide 3 levels of seating for guests that are younger and happy to sit on the ground through to grandparents that want to have a comfy couch to relax in. 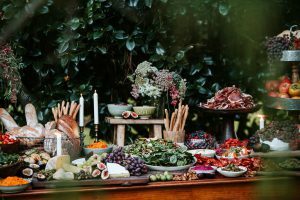 Have a chat with your caterer about food options, couples are often worried about a cocktail style wedding that there are always people that miss out on food or seemed to be avoided by the waitstaff! Consider a combination of a grazing station that is there for guests to come and go as they please throughout the evening, combined with cocktail style, Cocktail style doesn’t necessarily mean 3 small deep-fried spring rolls per person and that’s it. There is often a choice of 8 canapes per person plus 1 or 2 little bowls or substantial canapes which might be a noodle box or similar. The benefits of canapes are that you can choose a variety of ingredients and options rather then two choices for a sit-down meal meaning you might cater to your guest’s wide range of tastes by having lots to choose from. 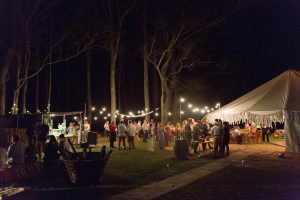 Having a late-night supper around 9 or 10pm at night with ham rolls or similar is often a popular option to ensure guests leave the wedding with full bellies.